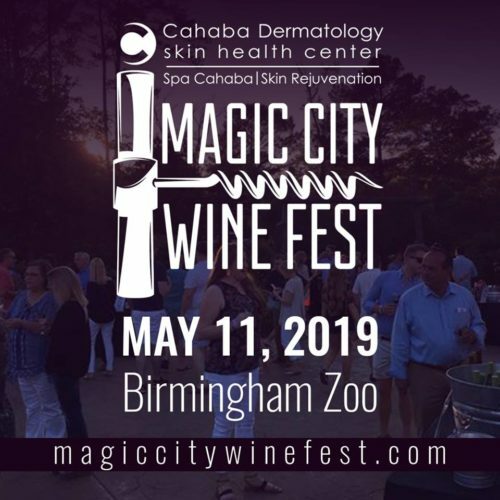 Come join us at the Birmingham Zoo for the 3rd Annual Cahaba Dermatology & Spa Cahaba Magic City Wine Fest on May 11th from 5:30pm-8:30pm as we travel through several different regions spanning the globe. Drink wine and beer specific to a certain region. Restaurants will also have food available for purchase. Take a break from your travels and enjoy the soothing sounds of live music. The World Tour will be held at the lovely Birmingham Zoo. A portion of every ticket will go to benefit the Birmingham Zoo. *Magic City Wine Fest is a rain or shine event and no refunds will be given. How much are drinks if they are not included in the ticket price? Unfortunately, according State law and ABC regulations we cannot give “unlimited free samples.” Therefore, the ticket price is your admission to Magic City Wine Fest. Once inside the festival, you need to give $0.01 for each one ounce serving. This “Penny a Pour” donation will be collected at each wine table where guests can drop a penny in for each drink. All attendees must be 21 or older; IDs will be checked prior to entering the event. Sorry no children or babies. Event is rain or shine, there will be no refunds. For more info about the Magic City Wine Fest, click here.